Illustrations note 8 Tables, black and white; XXII, 664 p.
Preface.-Preface to the Second Edition.-Introduction.-Fundamentals of Unconstrained Optimization.-Line Search Methods.-Trust-Region Methods.-Conjugate Gradient Methods.-Quasi-Newton Methods.-Large-Scale Unconstrained Optimization.-Calculating Derivatives.-Derivative-Free Optimization.-Least-Squares Problems.-Nonlinear Equations.-Theory of Constrained Optimization.-Linear Programming: The Simplex Method.-Linear Programming: Interior-Point Methods.-Fundamentals of Algorithms for Nonlinear Constrained Optimization.-Quadratic Programming.-Penalty and Augmented Lagrangian Methods.-Sequential Quadratic Programming.-Interior-Point Methods for Nonlinear Programming.-Background Material.- Regularization Procedure. MMOR Mathematical Methods of Operations Research, 2001: "The books looks very suitable to be used in an graduate-level course in optimization for students in mathematics, operations research, engineering, and others. Moreover, it seems to be very helpful to do some self-studies in optimization, to complete own knowledge and can be a source of new ideas... 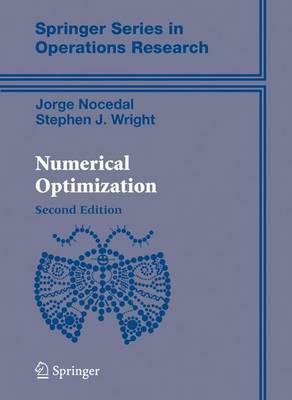 I recommend this excellent book to everyone who is interested in optimization problems."